Drush 9 has removed dynamic site aliases. Site aliases are hardcoded in YAML files rather than declared in PHP. Sadly, that means that many tricks you could do with the declaration of the site aliases are no longer available. The only grouping possible is based on the YAML filename. So for example, with the Acquia Cloud Site Factory site aliases generated by the 'blt recipes:aliases:init:acquia' command, you can run a command on the same site across different environments. But what you can't do is run a command on all the sites in one environment. One use case for this is checking whether a module is enabled on any sites, so you know that it's safe to remove it from the codebase. Currently, this is quite a laborious process, as 'drush pm-list' needs to be run for each site. While site aliases are fixed, they can be altered with Drush hooks. I considered that these might allow something to dynamically declare aliases, or a command option. There's an example of altering aliases with a hook in the Drush code. with each value it receives, in this case, each site alias. Another thing we will do with xargs is set the -t parameter, which outputs each actual command it executes on STDERR. That acts as a heading in the output, so we can clearly see which site is outputting what. The nice thing about the -t parameter is that as it's STDERR, it's not affected by the final pipe to ag for filtering output. So the output will consist of the drush command for the site, followed by the filtered output. In conclusion: dynamic site aliases in Drush were nice, but the maintainers removed them (as far as I can gather) because they were a mess to implement, and removing them vastly simplified things. Doing the equivalent with xargs took a bit of figuring out, but once you know how to do it, it's actually a much more powerful way to work with multiple sites at once. When you check out a branch or commit with git, two things happen: git changes the files in the repository folder, and changes the file that tells it what is currently checked out. In git terms, it changes what HEAD points to. In practical terms, it updates the .git/HEAD text file to contain a different reference. But these two operations can be done separate from one another, so that while the files correspond to one commit, git thinks that the HEAD commit is another one. This of course puts your git repository in an unstable, even unnatural state. But there are useful reasons for doing this, and one of these comes up in the operation of dorgflow, my tool for working with git and drupal.org patches. Dorgflow creates a local branch for a drupal.org issue, and creates a commit for each patch, so you end up with a nice sequential representation of the work that's been done so far. But every patch that's uploaded to an issue is a patch against the master branch, so we can't just apply the patches one by one and make commits: the first patch will apply, and all the subsequent ones will fail. * [Feature branch] Patch 1 <- Make patch 2 commit on top of this commit. * [master branch] Latest master commit. <- Apply patch 2 to these files. In git terms, we want the current files (the working tree, as git calls it) to be on the master branch, while git's HEAD is on the feature branch. Put git on the feature branch. Check out the master branch's files, with git checkout master -- . When you use git checkout command with a file or files specified, it doesn't move HEAD, but instead changes just those files to the given commit or branch. If you give '.' as the file to check out, then it does that for all of the repository's files. In effect, you get the files to look like the given commit, in our case the master branch. This is what we want, but it has one crucial flaw. Suppose patch 1 added a new file, foo.php. When we check out master's files, foo.php is not changed, because it's not on master. There's nothing on master to overwrite it. The 'git checkout master -- .' doesn't actually say 'make all the files look like master', it says 'check out all the files from master'. foo.php isn't on master, and so it's simply left alone. Suppose now that patch 2 also adds the foo.php file, which it most likely will, since in most cases, a newer patch incorporates all the work of the previous one. Applying patch 2 to the files in their current state will fail, because patch 2 tries to create the file foo.php, but it's already there. So this approach is no good. I was stuck with this problem with dorgflow for months, until I had a brainwave: instead of staying on the feature branch and changing the files to look like master, why not check out the master branch, but tell git that the HEAD is the feature branch? That solves the problem of the foo.php file: when you check out master, the foo.php that's at the patch 1 commit vanishes, because it doesn't exist on master. So applying patch 2 will be fine. The only remaining question was how to you tell git it's on a different branch without doing a checkout of files? Turns out this is a simple plumbing command: git symbolic-ref HEAD refs/heads/BRANCH. This is just telling git to change the reference that HEAD points to, and that's how git stores the fact that a particular branch is the current one. This was a simple change to make in dorgflow (it was actually more work to update the tests so the mocks had the correct method call expectations!). This means that dorgflow accordingly now handles applying a sequence of issue patches that add files now works in the latest release. It's no secret that I find Composer a very troublesome piece of software to work with. I have issues with Composer on two fronts. First, its output is extremely user-unfriendly, such as the long lists of impenetrable statements about dependencies that it produces when it tells you why it can't make a change you request. Second, many Composer commands have unwanted side-effects, and these work against the practice that changes to your codebase should be as simple as possible for the sake of developer sanity, testing, and user acceptance. I recently discovered that removing packages is one such task where Composer has ideas of its own. A command such as remove drupal/foo will take it on itself to also update some apparently unrelated packages, meaning that you either have to manage the deployment of these updates as part of your uninstallation of a module, or roll up your sleeves and hack into the mess Composer has made of your codebase. Guess which option I went for. This will have two side effects, one of which you might want, and one of which you definitely don't. This is fine, in theory. You probably don't need the modules that are dependencies of foo. Except... Composer knows about dependencies declared in composer.json, which for Drupal modules might be different from the dependencies declared in module info.yml files (if maintainers haven't been careful to ensure they match). UPDATE: I've been informed in comments that drupal.org's packaging process ensures these are kept in sync. So that's one less thing to worry about! Furthermore, Composer doesn't know about Drupal configuration dependencies. You could have the situation where you installed module Foo, which had a dependency on Bar, so you installed that too. But then you found Bar was quite useful in itself, and you've created content and configuration on your site that depends on Bar. Ideally, at that point, you should have declared Bar explicitly in your project's root composer.json, but most likely, you haven't. So at this point, you should go through Composer's output of what it's removed, and check your site doesn't have any of the Drupal modules enabled. If you find that any modules are still enabled, then revert the changes you've just made with the remove command, and declare the modules in your root composer.json, copying the declaration from the composer.json file of the module you are removing. Then start step 1 again. This is undesirable basically because any package update is something that has to be evaluated and tested before it's deployed. Having that happen as part of a package removal turns what should be a straight-forward task into something complex and unpredictable. It's forcing the developer to handle two operations that should be separate as one. So to revert this, you need to pick apart the changes Composer has made, and reverse some of them. Before you go any further, commit everything that Composer changed with the remove command. In my preferred method of operation, that means all the files, including the modules folder and the vendor folder. I know that Composer recommends you don't do that, but frankly I think trusting Composer not to damage your codebase on a whim is folly: you need to be able to back out of any mess it may make. The composer.lock file is the record of how the packages currently are, so to undo some of the changes Composer made, we undo some of the changes made to this file, then get Composer to update based on the lock. Your composer lock file now looks as it did before you started. Use either git add -p or your favourite git GUI to pick out the right bits. Understanding which bits are the 'right bits' takes a bit of mental gymnastics: overall, we want to keep the changes in the last commit that removed packages completely, but we want to discard the changes that upgrade packages. But here we've got a reverted diff. So in terms of what we have here, we want to discard changes that re-add a package, and stage and commit the changes that downgrade packages. the change to the content hash should be unstaged. Then commit what is staged, and discard the rest. Then do a git diff of composer.lock against your starting point: you should see only complete package removals. This will restore the packages that Composer updated against your will in step 1 to their original state. If you are committing Composer-managed packages to your repository, commit them now. You should see only composer.json, composer.lock, and the autoloader's files. PS. If I am wrong and there IS a way to get Compose to remove a package without side-effects, please tell me. --no-update only changes composer.json, and makes no changes to package files at all. I'm not sure what the point of this is. --no-update-with-dependencies only removes the one package, and doesn't remove any dependencies that are not required anywhere else. This leaves you having to pick through composer.json files yourself and remove dependencies individually, and completely obviates the purpose of a package manager! Why is something as simple as a package removal turned into a complex operation by Composer? Honestly, I'm baffled. I've tried reasoning with the maintainers, and it's a brick wall. PPS. Since writing this post, I’ve made Composer Manifest a small Composer plugin which makes it easier to see what Composer has decided to change behind your back. Every time you do a Composer update, install, or remove, it writes a YAML file that lists all the installed packages with their versions. Committing that to your repository means you have an easy way to see exactly what's been changed and when. It's now just over 10 years since webchick handed maintainership of the Module Builder project over to me. I can still remember nervously approaching her at the end of a day at DrupalCon 2008, outside the building where people were chatting, and asking her if she'd had time to look at the patches I'd posted for it. I was at my first DrupalCon; she'd just been named as the core co-maintainer for the work about to start on Drupal 7. No, she hadn't, she said, and she instantly came to the conclusion that she'd never have the time to look at them, and so got her laptop out of her rucksack and there and then edited the project node to make me the maintainer. Given the longevity of the project, I am often surprised when I talk to people that they don't know what its crucial advantage is over the other Drupal code generating tools that now also exist. Drupal Code Builder, as it's now called, is fundamentally different from Drupal Console's Generator command, and the Drupal Code Generator library that’s included in Drush 9. I feel that perhaps this requires a buzzword, to make it more noticeable and memorable. 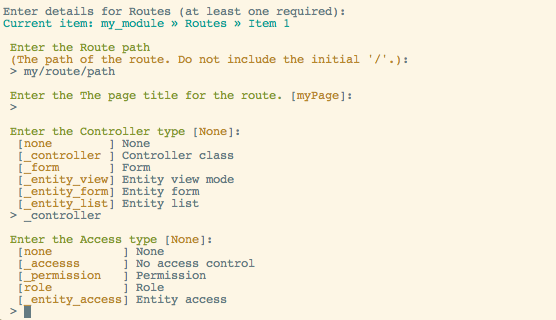 So here is one: Drupal Code Builder is an analytical code generator. I'm going to add a second one: the Drupal Code Builder Drush commands and Module Builder (which still exists, though is now just module that provides a Drupal-based UI for the Drupal Code Builder library) are adaptive. What do I mean by those? When you first install Drupal Code Builder, it has no information about Drupal hooks, or plugin types, or services. There is no data in the codebase on how to generate a hook_form_alter() implementation, or a Block plugin, or how to inject the entity_type.manager service. Before you can generate code, you need to run a command or submit an admin form which will analyse your entire codebase, and store the resulting data on hooks, plugin types, services, and other Drupal structures (the list of what is analysed keeps growing.). The consequence of this is huge: Drupal Code Builder is not limited to core hooks, or to the hooks that it's been programmed for. Drupal Code Builder knows all the hooks in your codebase: from core, from contrib module, even from any of your own custom code that invents hooks. Now repeat that statement for plugin types, for services, and so on. And that analysis process can, and should, be repeated when you download a new module, because then any Drupal structures (hooks, plugin types, etc) that are defined in new modules gets added to the list of what Drupal Code Builder can generate. Generate a new plugin type. This creates a plugin manager service class and declaration, an annotation class that defines the plugin annotation, and an interface and base class for the plugins. Generate a plugin of the type you've just made. When I say that this technique of analysis makes Drupal Coder Builder more powerful than other code generators, I'm not even blowing my own trumpet: the module I was handed in 2008 did the same. Back then in the Drupal 6 era is needed to connect to drupal.org's CVS repository to download the api.php files that document a module's hooks (which is why the Drush command for updating the code analysis prior to Drush 9 is called mb-download). For Drupal 7, the api.php files were moved into the core Drupal codebase, so from that point the process would scan the site's codebase directly. For Drupal 8, I added lots more code analysis, of plugin types and services, but still, the original idea remains: Drupal Code Builder knows how to detect Drupal structures, so it can know more structures than can be hardcoded. My second buzzword, that UIs for Drupal Code Builder are adaptive, describes the way that neither of the Drush command nor the Drupal module need to know what Drupal Code Builder can build. They merely know the API for describing properties, and how to present them to the user, to then pass the input values to Drupal Code Builder to get the generated code. This is analogous to the way that Form API doesn’t know anything about a particular form, just about the different kinds of form elements. This isn’t as exciting or indeed relevant to the end-user, but it does mean that development on Drupal Code Builder can move quickly, as adding new things to generate doesn’t require coordinated releases of software packages for the UI. In fact, I think nearly every new release of Drupal Code Builder has featured some sort of new code generating functionality, while keeping the API the same. Similarly, an even later version of Drupal Code Builder added code analysis to detect all top-level admin menu items, and so the admin settings form generation now lets you pick where to place the form in the menu. It would be nice to think that a couple of buzzwords could gain Drupal Code Builder more attention and more users, but I fear that Drupal Console’s generator has got rather more traction in Drupal 8, despite its huge limitation. It’s disappointing that Drush has now added a third code generator to the mix, to even further dilute the ecosystem, and that it’s just as limited by hardcoding. Well, people get attached to UIs, but they don’t care much about what powers them, especially in this day and age of Composer, where adding dependencies no longer creates an imposition on the end-user. 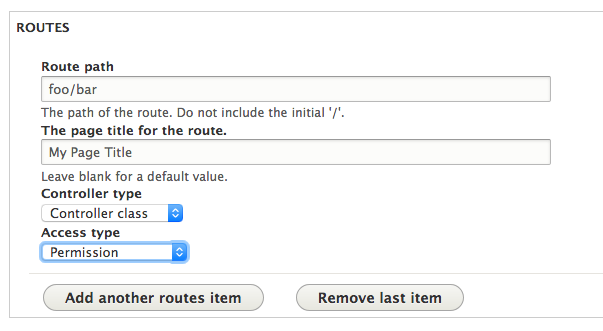 So I suggest the following: the code analysis portion of Drupal Code Builder could be extracted to a new package. It doesn’t depend on anything on the code generation side, so that should be fairly simple. It provides an API that supports analysis being run in batches, which could maybe do with being spruced up, but it’s good enough for a 1.0.0 version for now. Then, any code generating system would be able to use it. Both Console and Drush could replace their hardcoded lists of hooks and plugins with analytical data, while keeping the commands they expose to the end-user unchanged. I’ll be at DrupalEurope in Darmstadt, where I’ll be running a BoF to discuss where we go next with code generation on Drupal. One of the big challenges with updating Drupal Code Builder for Drupal 8 has been the sheer variety of code to be output. On earlier versions of Drupal, it was just about hooks, and all that needed to be done was to take the API documentation code and replace 'hook_' with the module name. There were info files too, and Drupal 7 added the placing of hooks into different .inc files, but compared to this, Drupal 8 has things like plugin annotations, fluent method calls for content entity baseFieldDefinitions(), FormAPI arrays, not to mention PHP class methods, and more. But one of the things I enjoy about working on DCB is that I am free to experiment with different ideas, much more so than with work on core or even contrib. It is its own system, without any need to work with what a framework supplies, and it has no need to be extensible. So I can try a new way of doing things as often as I want, and clean up when I've had time to figure out which way works best. For example, up until recently, the code for a field definition in baseFieldDefinitions() was getting generated in three different ways. First, the old-fashioned way of doing it line by line, then concatenating the array with a "\n" to make the final code. This is the way most of the old code in DCB was done, but with things that need handling of terminal commas or semicolons, and nesting indents and so on, it was starting to get really clunky. So then I tried writing something loosely inspired by Drupal's RenderAPI. Because that's a nice big hammer that seems to fit a lot of nails: make a big array of data, chuck your stuff into it, then hand it over to something that makes the output. Except, not so good. Writing the code to make the right sort of array was fiddly. The array of data needed to combine actual data and metadata (such as the class of an annotation), which added levels to the nesting. What if the code that builds this could be the same, to the point where you could just copy-paste code from, say, the node entity class, and make a few tweaks? Creating the code in DCB would be much simpler, and having the DCB code look like the output code would make debugging easier too. It's not yet perfect, as the first line isn't done by this, and the handling of the t() calls could do with some polish; probably by creating a separate class called something like FunctionCall, such that FunctionCall::somefunction() returns the code for a call to somefunction(). But the efficiency and elegance of this approach has led me to devise a new principle for DCB: builder code should look as much as possible like that code that it outputs. Magic methods used there as well, this time for static calls. The similarity to the output code isn't as good, as annotations aren't PHP code, but it's still close enough that you can copy the code you want to output, make a few simple changes, and you have the builder code. This work has embodied another principle that I've come to follow: complexity and ugliness should be pushed down, hidden, and encapsulated. Here, the ClassAnnotation and FluentMethodCall have to do fiddly stuff like quoting string values, recurse into nested arrays. They have to handle special cases, like the last line of a fluent call has a semicolon and the last line of an annotation has no comma. All of that is hidden from the code that uses them. That can get on with doing the interesting bits.